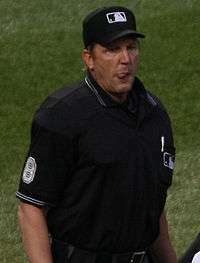 Jeffrey William Kellogg (born August 29, 1961) is an umpire in Major League Baseball who has worked in the National League from 1991 to 1999 and throughout both major leagues since 2000. He wears uniform number 8, formerly worn in the NL by Hall of Fame umpire Doug Harvey from 1962-92. For the 2016 season, he was the crew chief of Crew I.
Kellogg has umpired in two Major League Baseball All-Star Games (1997, 2009), eight Division Series (1998, 2000, 2003, 2007, 2008, 2010, 2011, 2014), six League Championship Series (1999, 2001, 2002, 2004, 2006, 2012), and five World Series (2000, 2003, 2008, 2010, 2014 - as Crew Chief ). He was promoted to crew chief in 2010 and assigned Crew G with Larry Vanover, Jeff Nelson and Mark Carlson. Kellogg was behind the plate in 2006 when Aníbal Sánchez threw a no-hitter. He was also the plate umpire for Ubaldo Jiménez's no-hitter in 2010. In both games, Miguel Olivo was the catcher. Kellogg was the third base umpire for Mark Buehrle's no-hitter against the Texas Rangers on April 18, 2007. On April 27, 2012 in a game between the Baltimore Orioles and Oakland A's, Kellogg tackled a shirtless man who had run onto the field and slid into home plate at Oriole Park at Camden Yards after the man had eluded Baltimore police for nearly two minutes. Kellogg was chosen to serve as the crew chief for the one-game Wild Card playoff between the Atlanta Braves and the St. Louis Cardinals on October 5, 2012. ↑ Video: Umpire Jeff Kellogg tackles fan on the field cbssports.com. ↑ Umpires for Wild Card Games, Division Series announced Darling, Kellogg Will Serve As Crew Chiefs for Wild Card Games; Davis, DeMuth, Gorman and West Assigned to Lead Division Series Crews. MLB.com. Retrieved October 5, 2012.